"Der kleine Künstler" (Stilleben mit Malutensilien und Papagei) originales Ölgemälde auf Malplatte ca.54x38cm; unten rechts monorammiert "A.W." und datiert "(18)96"
Die Maße im aufwendig gearbeiteten und blattvergoldeten Holzrahmen der renommierten Münchner Fachwerkstatt Petzenhammer betragen 67x50cm. 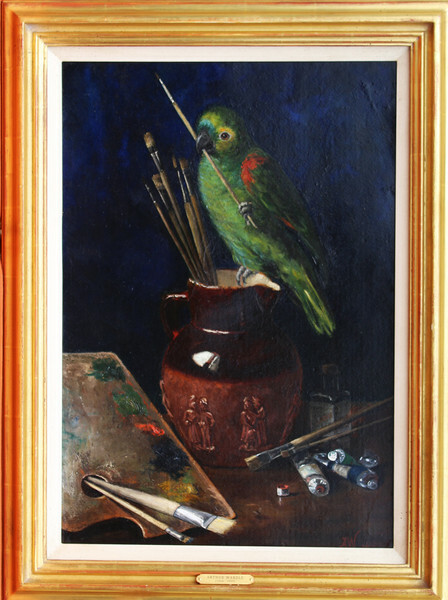 "The little artist" (Still Life with Painting Utensils and an Amazon Parrot) original oilpainting on cardboard approx.48x74cm; bottom right monogrammed "A.W." and dated "(18)96"
Dimensions of the leaf-gilt wooden frame of the Munich professional workshop Petzenhammer 67x50cm. Arthur Wardle was a British artist and animalier painter. His prolific oeuvre focused on his fascination with dogs of various breeds, creating rich, naturalistic paintings of domestic pets and hunting animals captured in moments of lifelike movement. 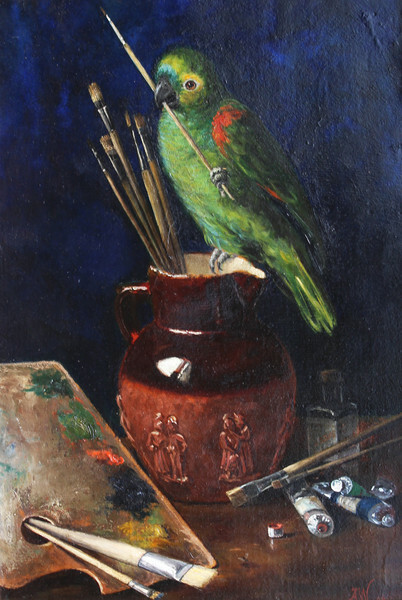 His work is characterized by its high degree of realism, and is representative of the 19th century interest in detailed artistic representations of animals. Born in 1860 in London, England, Wardle notably began exhibiting his work at age 16 at the Royal Academy. He began his career by sketching cattle near the Thames River, and would frequently depict exotic wildlife by studying them at the London Zoo and then transposing them onto local landscapes. Wardle was widely appreciated and acclaimed for his paintings, garnering inclusion among the Pastel Society in 1911 and the Royal Institute of Painters in Water Colours in 1922. 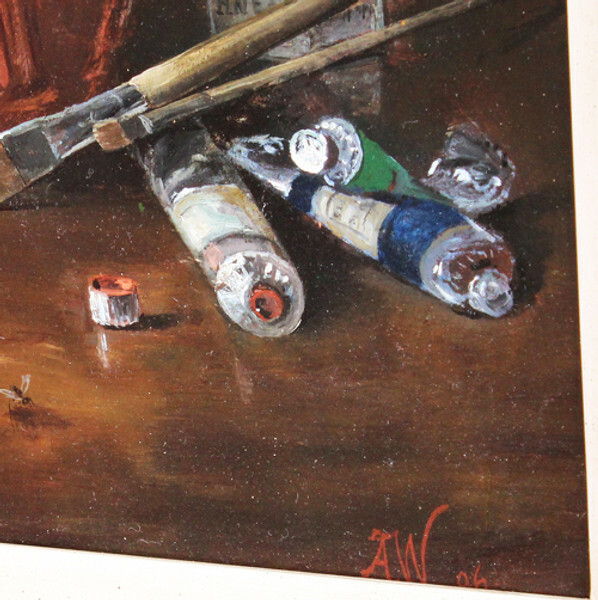 Wardle died on July 16, 1949 in London, Engalnd, and his legacy lives on through his images' reproduction on commercial products like chocolate boxes, posters, calendars, and postcards. Today, the artist’s work can be found amongst the collections of the London-based Tate Gallery, Leeds Museum, and The Kennel Club.